Most of the books I read now I pick up on reserve at the library, but I love it when I just stumble on a really good book. I was at the library a few weeks ago and had nothing to fill the nonfiction slot in my regular reading. So I looked up Gretchen Rubin’s Better Than Before (a favorite) in the online card catalog, then went to that shelf to see what else I could find there. 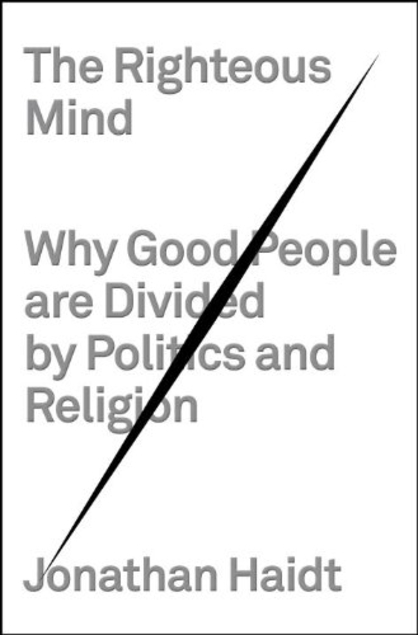 And so I found Jonathan Haidt’s The Righteous Mind: Why Good People Are Divided By Politics and Religion. A book exploring why we end up on opposite sides of the political spectrum? Yes, please! A) Different groups around the world have strikingly different moral systems. Much of this comes down to whether morality is based purely on whether an action causes harm or not (it’s almost never just that). Everyone agrees it’s wrong to hurt others, but after that there’s divergences in whether something can be wrong, and for everyone, even if it causes no direct harm. B) Our intuition reacts first, inclining us one way or another, and then rationality steps in second to justify our intuition. I don’t 100% believe this (or maybe I don’t want to!) I want to believe we can use our minds to come to rational conclusions, but I don’t deny intuition is a huge force. He uses an analogy of a very small rider (rationality) directing a very big elephant (intuition). I can’t help a Star Trek analogy myself–Spock is the voice of logic, but Kirk with his gut hunches is still Captain–but Kirk listens to Spock too (and McCoy, who I suppose would be in there checking how we feel about things). C) The big takeaway for me was when Haidt explores in-depth six moral foundations: Care/Harm, Fairness/Cheating, Liberty/Oppression, Loyalty/Betrayal, Authority/Subversion, Sanctity/Degradation. Different political groups emphasize these foundations differently, and when there is conflict, it may be because people are coming from different moral foundations. I see Care vs. Liberty at odds often (as in the “political correctness” debate. One side argues that certain speech causes pain, the other argues for their liberty to speak as they like). Liberals come primarily from a Care/Harm perspective with some lesser focus on Liberty/Oppression and Fairness/Cheating, while Conservatives come from all six foundations. All these ideas are a lot to take in, and Haidt does a good job walking through them in a clear fashion–and provides a helpful summation of key points at the end of each chapter. He uses some metaphors (like the rider and elephant) that carry through multiple chapters and help give a concrete way to talk about often abstract ideas. He lost me somewhat in the middle of the book, when he got into an extensive exploration of how evolution can be explained as the cause for all our noblest impulses (generosity, self-sacrifice, etc). It was interesting theory, but I felt it began to reduce humanity to nothing but a collection of neurons with particular inclinations. I come from a religious perspective; I believe in evolution, but I also believe that love, altruism, even creativity, are indicators that humans are something more than very smart animals–or even collections of very clever cells. Of course, maybe that’s my intuitive elephant inclining against his argument! Still, I don’t think that elephant is always wrong. Even if this one aspect of the book didn’t really resonate for me, my use of his metaphor probably indicates that much of the rest did. Mainly (and the reason I’ve been recommending it to friends), I found this book so helpful as a way to look at exactly what the subtitle suggests–why do good people get divided on morality and social issues? I believe there are good people on every level of the political spectrum (barring perhaps the far extremes at either end), so why do we end up so polarized? There is frequent rhetoric out there demonizing the other side (any other side), and The Righteous Mind offers another, better way to look at it. The other side isn’t evil, and they don’t just not care–but they’re emphasizing a different moral good. We can still argue (or discuss civilly, if possible) about which moral good is more important, or the right ways to implement a positive change, but just accepting that the other guy (or girl) wants the good of society too seems like a really good first step. The Righteous Mind, for me, provided some helpful framing to do that. You are the second person to recommend this book to me. I will have to read it. I, too, want to explore how we got so polarized as a country when there are obviously good people on both sides.